At Arbuthnots we’re always on the lookout for new and innovative products whether they are contact lenses or spectacles. Our patients have had great success recently using the fantastic clariti® range of lenses by Sauflon so we are delighted to announce that Sauflon have now extended their available range meaning far more patients with astigmatism can now benefit from this innovative technology. If you have ever been told you aren’t suitable for contact lenses, you may now be able to enter this life changing world! 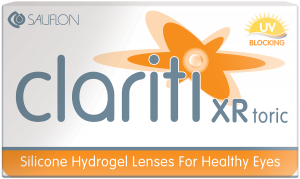 clariti® XR toric is especially designed to give consistently clear vision if you have astigmatism with all the benefits of the unique clariti® material. This special material is super-breathable allowing oxygen to pass through to the eye meaning comfortable lenses for as long as you want to wear them and even includes UV protecting for long-lasting health. We offer free trial appointments* of most contact lenses including clariti® XR toric so come on in and you’ll see the difference these fantastic lenses could make.